Simple, fresh and just the thing when you’re tight on time. 1. Preheat the oven to 180˚C, gas mark 4. Stir together the soy (or tamari), lime zest and juice, honey, ginger and miso; use to coat the salmon. Bake on a foil-lined tray for 8-10 minutes. Mix the cucumber with the rice vinegar and set aside. 2. Meanwhile, cook the soba noodles according to pack instructions. Drain and refresh under cold water, toss with the sesame oil, then toss in the bowl with the cucumber. Put the pak choi in the pan with 2 tbsp water, cover and cook over a medium-high heat for 4-5 minutes, until wilted. 3. 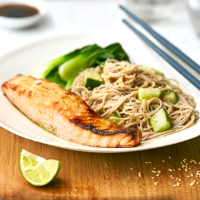 Put the noodles, pak choi and salmon in a shallow serving bowl and sprinkle with toasted sesame seeds, if liked.